This is a summary of William Branham's teaching on the Godhead and also contains links to articles on various doctrines taught by William Branham with respect to the nature of God. Godhead means “the nature of God”, but is usually a term for “what” God is, rather than “who” God is. At its greatest depth, knowing about someone is much less rewarding that knowing someone. Still, it is a start. We do not spend time in this article highlighting the problems with William Branham's beliefs. That discussion is contained in other articles in this series, which can be accessed from the links at the top of the page and attempt to point out specific problem areas with William Branham's belief system. . The purpose of this article is simply to highlight what he believed. In the past, some Christians in positions of power have persecuted heretics (or anyone who disagrees with their own favourite doctrine). But persecuting heretics is as spiritual as stoning the good Samaritan. The treatment of the Cathars at the hands of the Catholics, most notably in the massacre in Beziers in 1209 A.D., is a historic example of this persecution. Jesus taught that only those who had a pure heart would see God (Matthew 5:8). So even though what we are describing is heresy, there is no need to stone or persecute Branhamites. What there is a need for is to be merciful. And now, there are those sitting here who are feeble this afternoon, that's in need of physical healing. And we have chosen these few words to read from Thine. And may the Holy Spirit, the third Person of the Trinity, come in now, the Promise, the Comforter, that You said You would send. And He would take the things of God and would show them to us. In his early ministry, William Branham was very inclusive and extended open arms to both Trinitarians and Oneness believers (see the vision of the Plum and Apple Trees. In his sermon, The Godhead Explained, William Branham tells of when he was confronted by ministers of both the Assemblies of God (Trinitarian) and the United Pentecostal Church (Oneness) and forced to clearly define his doctrine. At the end of their discussion, William Branham had both representatives acknowledge that the other had the Holy Spirit. He then explained his method of baptism, which both representatives accepted. In this same sermon, William Branham tells of another confrontation with a UPC minister. This minister said "You know what we are going to do? We are drawing a little ring and drawing you right out of our circle." William Branham responded, "If you draw me out, I will draw you back in." William Branham's teachings on the Godhead were all over the map. As a result, this is one of the areas that most message believers apply the doctrine of Progressive Revelation. William Branham stated many times that both the Oneness and Trinitarians were wrong and that the truth was somewhere in between. William Branham also taught that Jesus Christ was part of God's creation. I said, "Yes, He was Divine. He was the created Son of God." And I said, "God was in Him reconciling the world to Himself." Now notice! And after then the wise men identifying Him what He would be, and we find through the Scripture that's exactly what He was: Deity in service for death. What for? Deity in service to God for death. Jesus was Deity in service for death, to redeem the world. But what did the world do to It? They refused It. They rejected It. Why? Some of them, a big part of them, did that because this: because He did die! They said, "He couldn't be Deity and die." The Man (the body) was not Deity, but Deity was in the body. This body has to perish. The very Christ that's in you is the only thing that can raise you up. That's Deity, God in you. Nestorianism is basically the doctrine that Jesus existed as two persons, the man Jesus and the divine Son of God, rather than as a unified person. William Branham's teaching on the nature of Christ was clearly tainted by Nestorianism. It is even more clearly developed in the teachings of Lee Vayle. God was in Him. He was a man, but He was a—a dual Person. One, He was a man; the Spirit in Him was God. 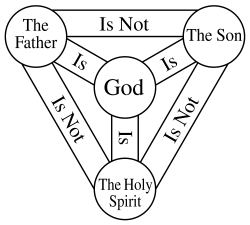 ...all who believe in the Trinity are possessed of the devil; that the Nicene Creed gave "birth to a faith which has entirely overturned the Christian church." “The grand error which we learn from [this] whole work is, that there are not three persons in one God. …Notwithstanding all [these] new revelations, I believe, according to the old one, “There are three that bear record in heaven, the Father, the Word, and the Spirit; and these three are one” For the term ‘person’ I contend not. I know no better: If any does, let him use it. …No there is not a word in all the Bible concerning any such union of the humanity of Christ with the divinity of the Father. He was then glorified, when he was received again into the glory which he had before the world began. …what heaps of absurdity are here! Only fit to have a place in Orlando Furioso. …Blasphemy, joined with consummate nonsense." Lee Vayle, who edited William Branham's book "The Church Ages" held that the mystery of the seven seals was the restoration of the correct teaching of the Godhead. If this doctrine of Lee Vayle's is correct, then the correct teaching on the Godhead was actually restored 300 years earlier by Emmanuel Swedenborg and had nothing to do with William Branham. "O my brethren, let none of you that fear God recommend such a writer any more; much less labor to make the deadly poison palatable, by sweetening it with all care! All his folly and nonsense we may excuse; but not his making God a liar; not his contradicting, in so open and flagrant a manner, the whole oracles of God! True, his tales are often exceeding lively, and as entertaining as the tales of... the fairies! But I dare not give up my Bible for them; and I must give up one or the other. If the preceding extracts are from God, then the Bible is only a fable! But if all Scriptures are given by inspiration of God, then let these dreams sink into the pit from whence they came." ↑ Thoughts on the writings of Baron Swedenborg, by John Wesley, Wakefield, May 8, 1782. This page was last edited on 20 May 2017, at 15:35.